This is the first in, what I hope will be, a series of blogs about Web Development on your Mac. 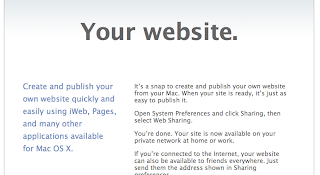 If you are a Mac user like me, you may already know that Mac OS X has an inbuilt web server (based on Apache) that can be used to host personal web sites. Click on the links to see the home page for each addressor on the "open..." buttons to see the Folder on your Mac where the root directory is for each site. I am going to use my personal site e.g. the one for my user name (rather than the one for my Mac) as the focus for this blog and the ones to follow. To make it easier to work with the files in your web site's Folder, open the appropriate Folder and drag it to your Finder's favourites. Now you'll be able to access the root folder easily any time you need it. If you have a Web development tool e.g. 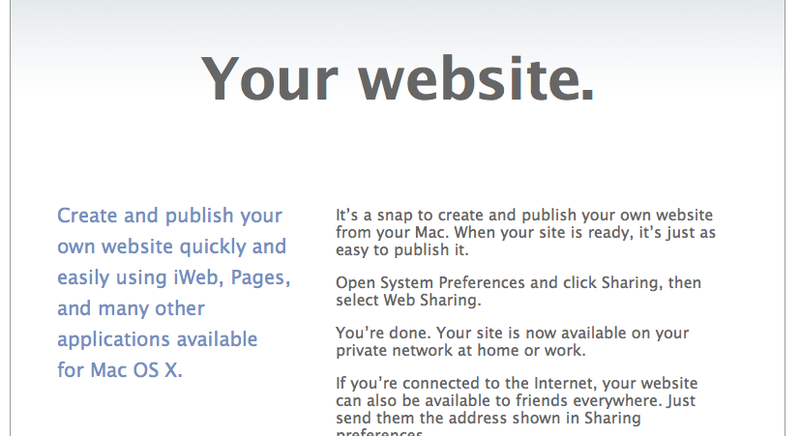 RapidWeaver, you can now publish web sites to your personal web server. That way you can publish and test multiple web sites at the same time and they won't interfere with each other. That's a start! In the next blog I will tell you how to tweak your underlying Apache web server settings to install things like PHP and MySQL.